The good thing about custards, golden cakes, and cream pies that use tons of egg yolks is, they are 1. fabulously delicious and 2. will help fatten you up, which is very good because you might get trapped in a cave or something without food. (If it can happen to the Hardy Boys, it can happen to you.) The bad thing is, you wind up with a ton of leftover egg whites. What to do? You could make a lovely meringue for your lovely pie, and Luscious would totally support you in that. Or you could make a healthy egg white omelet, and Luscious would not be so supportive, but whatever. However, if you’re not quite ready to use the egg whites, don’t throw them away! Jennifer knows when food is being wasted somewhere and suffers a small stroke. Please don’t give Jennifer a stroke—save your egg whites in a container in the fridge, they keep for weeks. 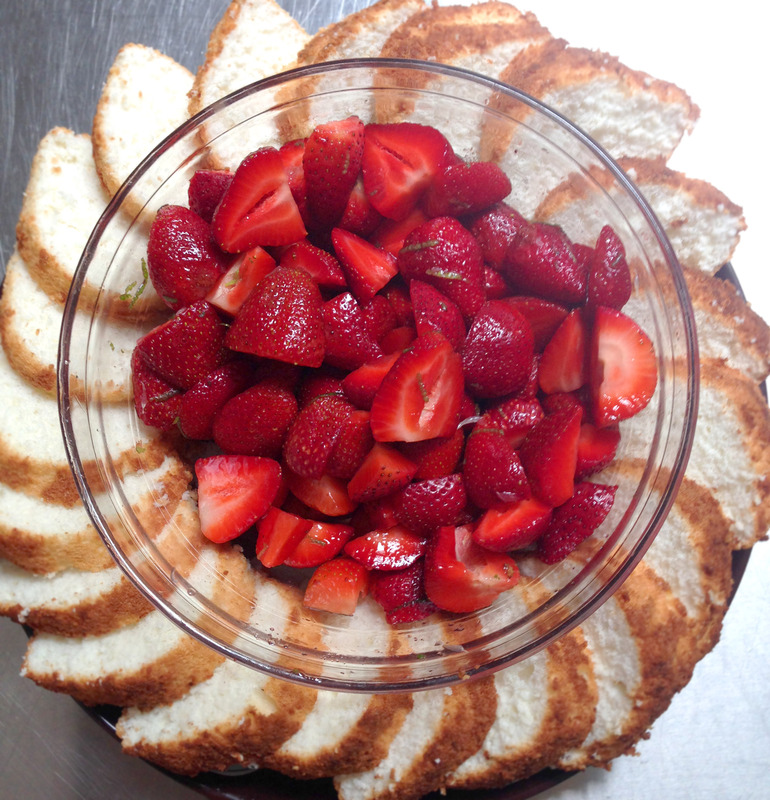 When you’ve got a dozen or so, it’s time to make an angel food cake! Many times, angel food cake is that sad dessert that was hurriedly picked up at the grocery store on the way the potluck and anonymously plopped down by the jello salad. It sits lonely, dry, and unwanted, still in its unopened plastic packaging. A homemade angel food cake, on the other hand, can be the bell of the ball! Thanks to all those fluffy exact whites, the texture is, truly, heavenly. However, egg whites and sugar on their own are not exactly a flavor powerhouse. Don’t you know Luscious has just the thing for that. Try to guess, but you won’t be able to. so we will just tell you, but don’t freak out. 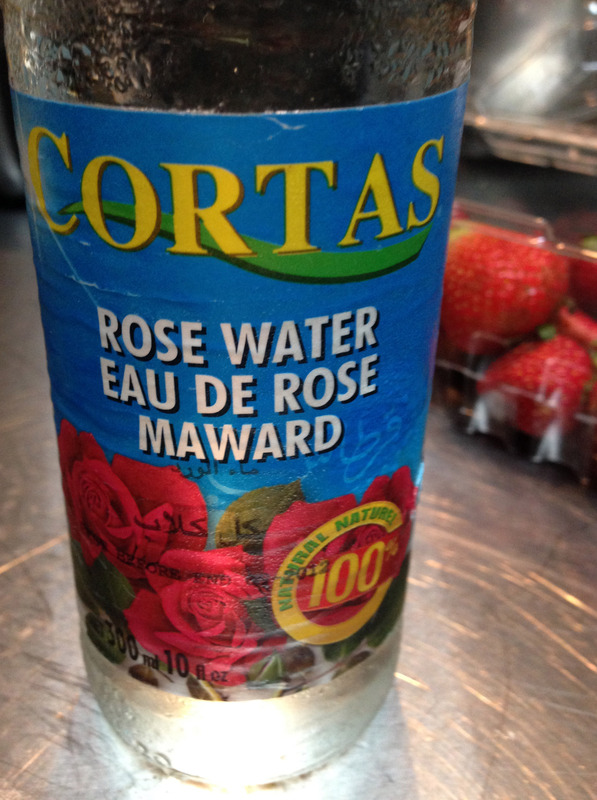 ROSEWATER. The flavor is unusual and exotic by western standards, but it’s common in middle eastern sweets. Just a little splash gives the cake a lovely depth of flavor. It’s easy to find in middle eastern specialty stores, and is inexpensive, and it keeps forevah in the fridge. And if you spill it on yourself, you will smell really good. 1 lb fresh strawberries. Get organic if you can, it makes a big difference in flavor. 3 tablespoons sugar… more or less. Taste your berries to decide how much you need. Pre-heat oven to 350º. Have ready a bundt or tube pan, but do NOT grease or flour– the cake won’t be able to “climb” the pan sides. Sift together the cake flour, ½ cup of sugar, and salt. Whip the egg whites, cream of tartar, water, lime juice, and rosewater with a handmixer on low speed for about 60 seconds. Increase mixer speed to medium, and beat mixture until soft peaks barely form. Very gradually beat in the remaining ¾ sugar. Continue beating until glossy, soft (not stiff) peaks form. Sift about 1/8 of the flour mixture evenly over the egg white mixture, and fold in gently with a rubber spatula just until incorporated. Continue gently folding in small amounts of the flour mixture until no flour remains. Pour batter into pan and smooth with spatula until level. Bake for 35-40 minutes until inserted toothpick comes out clean. After removing cake from oven, cool by inverting pan and place over the neck of a bottle, or setting it on drinking glasses. Sounds weird, but air needs be able to circulate under the cake while cooling. Allow cake to cool for 1-2 hours, then turn cake pan over and release cake by sliding a thin knife around all edges. Wash, hull, and slice strawberries (not thinly sliced, they’ll get mushy pretty quick.) 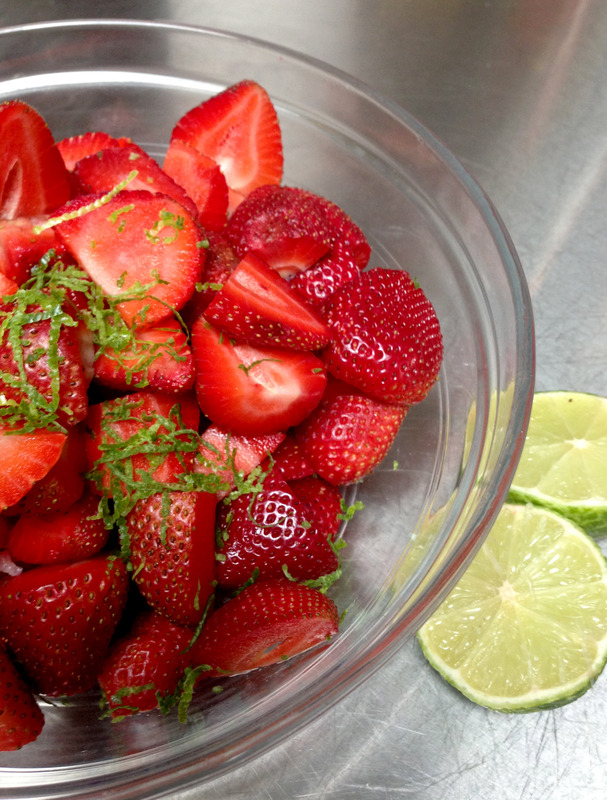 Toss with sugar, zest, lime juice and rosewater. Allow to sit for at least 20 minutes before serving, so they can macerate a bit. To serve, slice the cake and arrange the slices around the big bowl of berries. So pretty, you should probably get that baby on Pinterest!